Easton's E100G Catcher / Team Equipment Bag is large enough to hold all your gear and features massive lockable zippers and reinforced straps to stabilize load disbursement. FEATURES: Construction: T420D hex ripstop 600D polyester, Dimensions: 38" x 14" x 14", Massive lockable zippers, Reinforced straps to stabilize load disbursement, Duffle style bag, DOES NOT HAVE WHEELS. 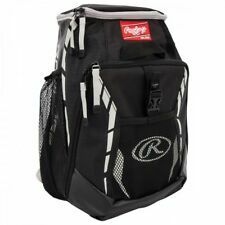 This is the perfect youth bat bag or works great as an adult softball bat bag too. 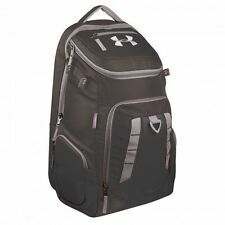 I use one for my adult softball league, and my children use there's for their youth baseball league. The ventilated back and pockets allow for exceptional airflow, keeping players comfortable and preventing odors caused by sweat and dirt. Designed with athletes in mind, Athletico understands the challenges that athletes have with traditional gear. 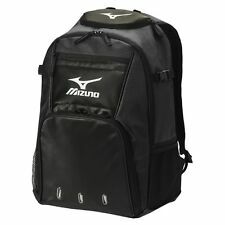 BASEBALL BACKPACK EQUIPMENT BAG ~ Rawlings Youth 12U Black 2-Bat Back Pack New! 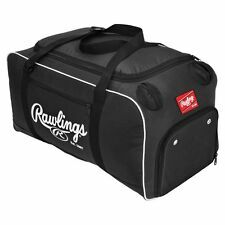 This new bag produced by Rawlings is hot among the kids right now and will hold all of your baseball or softball gear. Perfect for kids 12 & under. Roll into the dugout in style! The Fence hook is included. Securely holds up to three (3) bats. Built-In fence hook for on field organization. HeatGear padded back panel. Batting glove hook-up zone. UA Hardware. Team embroidery locations. Materials: DWR Treated 600D Polyester, Abrasion resistant PU coated bottom, Hyper Green zipper pulls and interior lining. 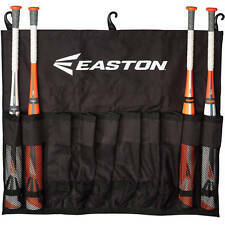 Easton Rampage Backpack Bat Bag Tote Baseball Softball 2 Bats Black/ Silver. Condition is Pre-owned. Shipped with USPS Priority Mail. FEATURES: Large center compartment holds helmet, accessories, gloves, shoes and even a complete set of catcher's gear, Large outer compartment stores up to four bats, Padded shoulder strap, Construction: 600D backed polyester with heavy-duty YKK zippers, Dimensions: 36" L x 12" W x 15" H, Bats Not Included. Exterior: Blue& orange. The bag has a slight odor. No Reserve! The product catalog may havestandard specifications taken from the manufacturer or other sources. Interior: Black. iSold It Pasadena has been serving the city of Pasadena and the surrounding communities since 2003. 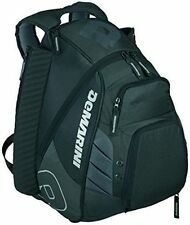 Demarini Voodoo Rebirth Bat Pack Backpack Baseball Bag Storage Black Yellow. Shipped with USPS Priority Mail. Backpack was never used and great condition. If you have any questions, feel free to ask! Two bat sleeves with personal zippered pockets. Sports Utility dual zipper design with fence hook for dugout functionality. We no longer send out paper copies. All bats will also be new and in the original wrapper. Model: LS TPX Locker Bag DLOCKXB. Made of durable 600-denier polyester with 420-denier dobby accents, the bag features a shoulder strap and a J-style fence clip. - J style fence hook. Feature 1 : Outer pockets for bat storage for up to 2 bats. : Franklin Sports, Inc. About Franklin Sports Inc. © 2018 Franklin Sports Inc. Product Category : Sports and Fitness. Feature 4 : Overall size: 19-1/4" X 14" X 7-1/4". Composite treated waterproof base material. Extensive Selection. Unbeatable Prices. WHY BUY FROM UO?. HELPFUL LINKS. Cold Steel. Combos (Rod Reel). Baits & Lures. The Miken Pro Roller Bag is built for the Player who lives out of their bag. Four side pockets for small storage and a Clear ID Pocket. The Removable decoration panel is easily removable for customization. Used bag with normal wear and in good condition. Trending at $26.86eBay determines this price through a machine learned model of the product's sale prices within the last 90 days. 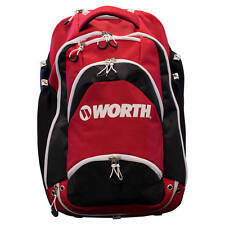 FEATURES: Measures 11" W x 9" D x 17" H, Intended for the youth ball player, Comfortable size for youth ball players, Main compartment to fit helmet, glove and shoes, Holds two bats comfortably, Front pocket for valuables and accessories, Padded shoulder straps and backing, Fence hook, BATS NOT INCLUDED. No other issues besides color defect. Holds lots of gear. Has wheels for rolling and handles for carrying. Bag is still in the factory plastic. Easton E110YBP Camo / Blue Youth Bat Pack Backpack Baseball / Softball. Condition is Pre-owned. Shipped with USPS Priority Mail. This is a pre-owned Nike Keystone Baseball/Softball Swoosh Logo Duffel Bat Bag. It is blue and black. It can be used for baseball or softball. It is in very good condition - I wiped it down on the outside and inside. Two external bat sleeves hold two bats and an external Velcro strip makes it convenient to access your batting gloves when heading to the plate. External Velcro strip for gloves and ventilated pocket for cleats. EASY-USE FENCE HOOK – Convenient j-style hook allows bag to hang on dugout fence for easy accessibility. 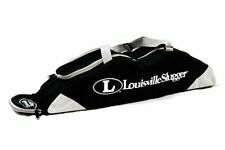 Louisville Slugger WTL9902BS Black / Red Prime Stick Pack Backpack New! Perfect size for ball players at all levels from youth leagues to adult slowpitch. Durable fence hook. New, never used before Functional Condition.